GhanaCelebrities.Com will as usual be covering this year’s Cannes Film Festival—and as always, we promise to bring you first hand exclusives, reviews of the biggest films, photos and videos of the various celebrities who will make it to the biggest film festival in the world. Last year, GhanaCelebrities.Com’s Cannes trip was partially financed by individual readers who love the work we do out here on the blog and we really appreciate their support. It’s that time of the year again when readers who love our work in general as well as the excellent coverage we bring from Cannes can DONATE to make this easy, charming and lift the financial burden of such expensive but important trip off our shoulders—remember, we are a small independent media house rocking it with the big corporate financed media outlets. So for those readers who LOVE the amazing but crazy work we do on GhanaCelebrities.Com—ranging from the thought provoking articles to film reviews, this is the time to show your appreciation by throwing in some coins by clicking the donate button below to support our coverage of the 69th Cannes Film Festival. Every little helps—and it will be nice to have you at our back. The 69th Festival de Cannes will run from 11th May, 2016 to 22nd May, 2016 and it will be presided by the Australian director, screenwriter and producer, George Miller—Woody Allen’s ‘Cafe Society’ will open the festival. Apart from GhanaCelebrities.Com, none of the known African websites/blogs covers the annual Cannes Film Festival directly each year— getting a press accreditation for Festival de Cannes is never easy and the accompanying cost of coverage is scary, huge enough to make several media houses not to venture. That’s why we are appealing to your pockets—and we promise, we won’t be partying on a yacht somewhere in France with your donations. It will go strictly towards our stay, upkeep and coverage of the Cannes Film Festival. This year’s festival is surely going to be interesting with an amazing line-up of films to be screened as well as celebrity appearances—and we don’t want our readers to miss the excitement. 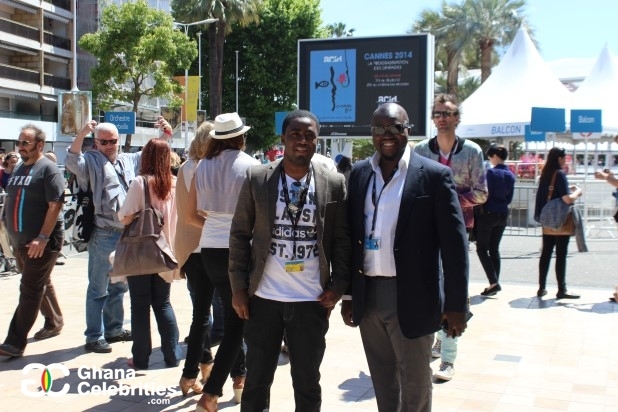 Chris-Vincent Agyapong Febiri at the 66th Cannes Film Festival with Fred Nuamah, Founder of Ghana Movie Awards.